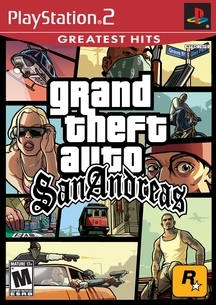 Grand Theft Auto: San Andreas Special Edition is part of the legendary series. In this Special Edition you'll get all-new content that expands your knowledge of the real-world people who inspire and create this world-famous game series. Carl Johnson left the San Andreas neighborhood of Los Santos five years ago, when it was being ripped apart by drugs and gang violence. When he returns in the early 90s, his mother has been killed, his family has fallen apart and his childhood friends are criminals. When crooked cops frame him for murder, he decides to save himself and his family by taking over the streets. The Introduction - This 30-minute prequel tells the real story behind the Grand Theft Auto series and features some familiar faces making a surprise return. Sunday Driver - A documentary about the low-rider life. Sunday Driver is a portrait of a community working together to build the ultimate customized vehicles while struggling to legitimize their lifestyle under close scrutiny of the cops. It's an upfront look at the guys behind the chrome. Hey, we've been selling things online for about 14 years, 3 months, and 13 days. Isn't that special?